Industry Minister Tony Clement announces he will add two questions on languages to the mandatory short-form census, and introduce legislation to remove jail threats for Canadians who refuse to fill out mandatory government surveys. Industry Minister Tony Clement says he will add two questions on languages to the mandatory short-form census, and introduce legislation to remove jail threats for Canadians who refuse to fill out mandatory government surveys. 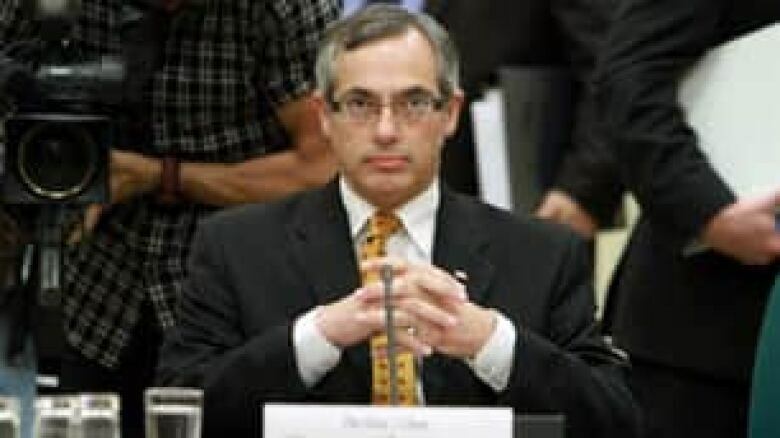 Industry Minister Tony Clement is shown before the House of Commons industry committee in Ottawa in July. ((Fred Chartrand/Canadian Press) )The move came as the embattled minister faced more questions about his handling of the government's move to scrap the mandatory long-form census and replace it with a voluntary survey. "Pursuant to new advice from the new chief statistician, as well as our own government's desire to do the right thing, we are migrating two questions over to the short-term census," Clement said Wednesday in an interview with the CBC's Evan Solomon. Can this person speak English or French well enough to conduct a conversation? What language does this person speak most often at home? Does this person speak any other languages on a regular basis at home? A francophone group had asked a Federal Court to seek an injunction against the Conservative government's move to scrap the mandatory long-form census, arguing it contravened the Official Languages Act. Clement said he has always maintained that the government will live up to its commitments under the act. "In an abundance of caution, we're doing the right thing," Clement said. "A little bit of water in our wine in the pursuance of our obligations under the language act is no crime." Should the long-form census be mandatory? Take our poll. The decision to cancel the mandatory long-form survey in spring 2011 prompted an outcry from a range of social and religious groups, as well as statisticians, opposition parties and some provinces, contending the quality of data from a voluntary form would be significantly lower than from a mandatory survey. Clement said the government would not reinstate the mandatory long-form survey despite the proposed legislative changes because of the "level of intrusion" in its questions. "We've solved the problem of jail time, but there's still the financial penalty," he said. Former Statistics Canada chief statistician Munir Sheikh resigned after Clement made comments in a Globe and Mail interview in July that suggested Sheikh and the agency recommended to end the mandatory long-form census and replace it with a voluntary survey. However, the minister said Wednesday he still stood by his view that he was advised that the government could get "useful and reliable data" from the changed survey. Opposition parties have said they will support the removal of threat of jail or fines for those who refuse to fill out the form, but have noted no one has been ever sent to prison. Speaking after Clement, NDP Leader Jack Layton said the minister should resign or be fired for having "botched" the census and misleading Canadians on what advice he received ahead of the decision. "He simply didn't tell the truth to Canadians," Layton told the CBC's Solomon. "When that happens at the level of a minister, there should be action taken." Earlier in the day, Liberal MP Bob Rae accused Clement of misleading Canadians in his statements about the voluntary survey, saying newly released government documents show the minister's claim that a voluntary long-form census survey would be statistically valid is "completely untrue." Rae said past census results show there has never been a compliance problem with the census, and accused Prime Minister Stephen Harper of using the survey changes to wage "guerrilla warfare" against every department of the civil service. "This has never been an issue for anyone aside from a government that is ideologically bent on undermining the trust that Canadians have in government, and that is fundamentally uninterested in the condition of the people," he said.